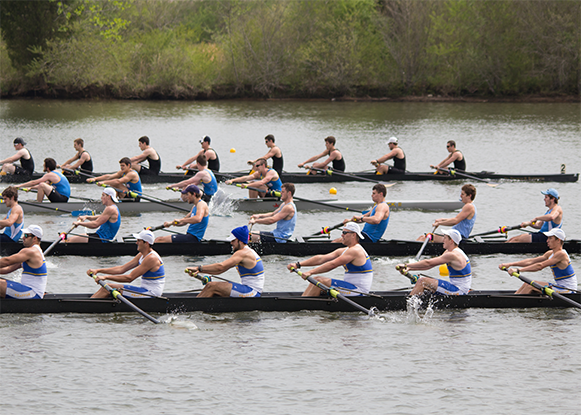 In the rowing world, Oak Ridge is known for having one of the country’s best training waterways available. Our race courses and venues offer visiting teams a challenging and fun spring training experience. For many Oak Ridgers, this means that rowing is associated with busy grocery stores, packed restaurants, and full hotels. However, there’s so much more to rowing than just a few new faces around town. Having been involved in the sport of rowing as an athlete and coach for over 20 years, I wanted to share some fun facts about rowing that may surprise you. 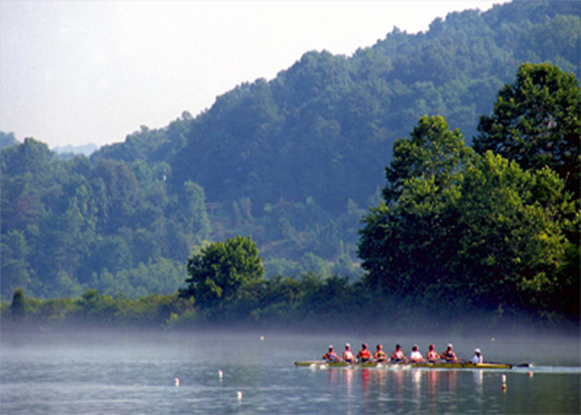 Rowing has a long history in Oak Ridge as the Oak Ridge Rowing Association was founded in 1978 with a mission to promote the sport of rowing in Oak Ridge and East Tennessee. Rowing dates back to the inception of the modern Olympic Games. In fact, the founder of the modern Olympics, Baron Pierre de Coubertin, was a rower. The Universities of Oxford and Cambridge ran the first ‘boat race’ and it’s become an annual tradition that continues to this day. 2. Rowing Was the First Intercollegiate Sport Held in the U.S.
Harvard and Yale competed in the first rowing race in 1858. The race was originally held on Lake Winnipesaukee in New Hampshire, but it has since moved to the Thames River, near New London, CT. Athletics contributed 125 athletes, swimming contributed 49 athletes, and rowing contributed 44 athletes in the 2012 games. The next largest delegation was volleyball, which sent 32 athletes. 8-oared shells are about 60-feet long, carry more than 1,750 pounds and weigh as little as 200 pounds. Singles may be as narrow as 10 inches across, weigh only 23 pounds, and stretch nearly 27-feet long. Rowers are superb examples of physical conditioning. Cross-country skiers and long distance speed skaters are comparable in terms of the physical demands the sport places on the athletes. Physiologists claim that rowing a 2,000-meter race – equivalent to 1.25 miles and done in about six minutes – is equal, physiologically speaking, to playing back-to-back basketball games. Anderson Cooper (Yale), Stephen Hawking (Oxford), Edward Norton (Yale), Gregory Peck (Cal Berkeley), Teddy Roosevelt (Harvard), Capt. Alan B. Shepard (Navy), Dr. Benjamin Spock (Yale/US Gold medal 1924), Bradley Cooper (Georgetown), Hugh Laurie (Cambridge), Winkelvoss Twins (Harvard) to name a few. Founded in 1818, the Leander Club in England is the world’s oldest public rowing club. The first rowing club in the US was the Detroit Boat Club, founded in 1839. The first amateur sport organization was a rowing club – Philadelphia Schuylkill Navy, founded in 1858. The first national governing body for a sport in the United States was for rowing. It was founded as the National Association for Amateur oarsmen in 1872. Its name was changed in 1982 to the United States Rowing Association. In 1999, the US men’s eight won its third consecutive gold medal at the world championships, a first in US history. In 2004, the US men’s eight won gold at the Olympic Games. In 2015, at the World Rowing Championships, the US women’s eight won gold and extended its streak of ten consecutive world or Olympic titles. Rowing is truly a sport for everyone. You can start as young as 12 years old, and you can row for as long as you want. In 2012, 93-year-old Charles Eugster of Switzerland won a gold medal in the World Rowing Masters Regatta in Duisburg, Germany. I started rowing in college simply because on a campus of 55,000 I needed to find my niche. I had never rowed before. Growing up in Colorado, I only knew skiing and white water rafting. I continued to row because of the people, because it was fun and because I knew I was going to stay fit! Rowing has taught me life lessons about integrity, time management, teamwork and how to push beyond myself.